Larry H. Miller was a Life Member of the NAACP Salt Lake Branch. He donated and presented scholarships to college students in January each year at the Annual Dr. Martin Luther King, Jr., Memorial Luncheon. Larry passed away in February of 2009, but the Utah Jazz scholarships continue. The NAACP Salt Lake Branch would like to thank the Utah Jazz for continuing this scholarship in remembrance of Larry. The fight for freedom is not free! Your membership and support will help fund initiatives and programs to accomplish our mission of racial equality and equal justice. Our civil rights organization welcomes the support of businesses to contribute to our scholarship fund. These scholarships are awarded in January to students attending colleges or universities in the state of Utah. Priority is given to NAACP members. 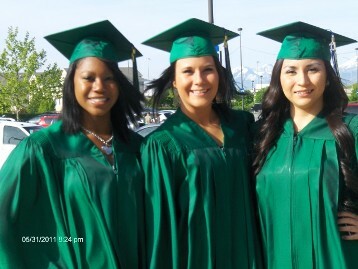 The NAACP Salt Lake Branch proudly congratulates the following graduates of the S.J. Quinney College of Law; University of Utah upon completing the requirements of its Juris Doctor program who received degrees Friday, May 11, 2012. They were previous scholarship recipients of the NAACP Salt Lake Branch. We salute them on their academic achievements. There are no pictures available at this time for our website. "Join the Fight for Freedom"
Scholarship applications available only to NAACP members enrolled and attending college. See our membership page for additional enrollment information. Find out if you qualify for a youth or college scholarship when you contact us at (877) 637-1958 in Salt Lake City, Utah.